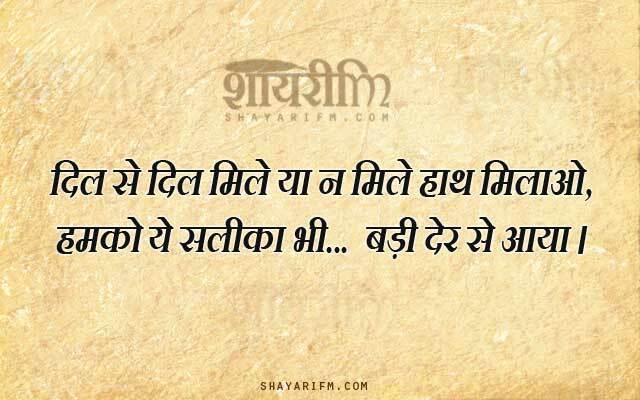 Read the latest collection of Two Line Shayari, 2 Line Shayari Sms and Short Shayari in Hindi. All these Heart Touching Two Line Shayari boasts many emotions in the heart with very few words. So read and feel the deep feelings of this poetry. Ye Kya Kiya Ke Nigaahon Se Gir Gaye. Hum Aitbaar Karke Gunaahgar Ho Gaye. Na Bikne Ka Iraada Ho Toh Keemat Aur Barhti Hai. Log Dil Mein Dimaag Liye Firte Hain. Kya Milega Chand Chamkeele Se Sheeshe Tod Ke.